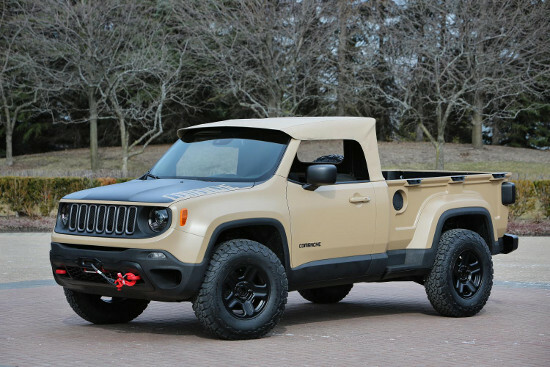 Jeep unveils butch Comanche concept pick-up: a potential winner? This entry was posted on March 16, 2016 by Van Rental. Here in the UK, Jeep is best-known for its upmarket American-style SUVs. But in the USA, the company has a devout following of off-road enthsuiasts. Many of these loyal fans come together in Moab, Utah each spring for the Jeep Safari event. This year is the 50th annual Jeep Safari and will coincide with the company’s 75% anniversary. So it’s a big deal. Inside, the Comanche features custom seat covers, pedal covers, door sill guards, and Mopar all-weather mats. Jeep Performance Parts like off-road rock rails, a 2-inch lift kit and a winch bolster the Comanche’s off-road capability. The Comanche rolls on 16-inch painted wheels and 32-inch BF-Goodrich All Terrain T/A tyres. However, what’s most interesting (remembering that this is the USA, home of big engines and cheap petrol) is that the Jeep Comanche is powered by a 2.0-liter diesel I-4 engine, mated Jeep’s smooth 9-speed automatic transmission. Is Jeep using this year’s event to try and persuade their most loyal customers that small, modern diesels are man enough to power these big off roaders? One of the other models due to be in action at the Jeep Safari is the Jeep Trailcat. Based on the Jeep Wrangler, the Trailcat is being billed as the ultimate off-road machine. Shoe-horned under the bonnet is a 6.2-liter HEMI Hellcat V-8 engine, mated to a 6-speed manual transmission. This result is a 707-horsepower beast that rides on 39.5-inch BF-Goodrich Krawler tyres, front and rear Dana 60 axles and Fox shocks. Subtle isn’t the word, but Jeep reckons that the interior is “simple yet functional”. The Jeep Trailcat is a one-off concept for the 2016 Jeep Safari. Based on a Jeep Wranger, it features a 6.2-liter HEMI V8 and 39.5″ tyres. This entry was posted on May 6, 2015 by Van Rental. It’s a quiet day today — perhaps because with election day tomorrow, anyone wanting press coverage might be holding off until there are fewer distractions around. 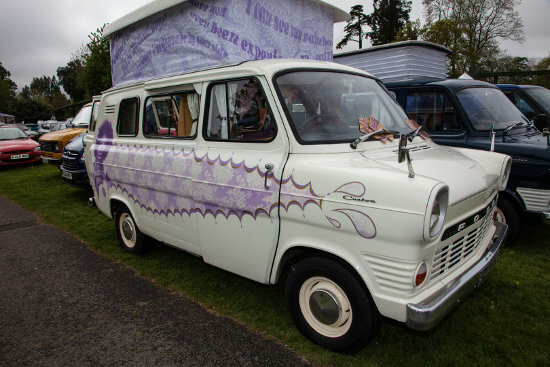 First up is Tasha Rose’s impressive 1969 Transit Campervan, complete with unique Jimi Hendrix-inspired artwork. Are you experienced? By sheer coincidence, today also marks the day when General Motors — the owner of Vauxhall — becomes the first car manufacturer in the world to produce 500 million vehicles. A significant number of these have been British-built Vauxhalls, such as the new Vivaro: the Luton-based firm has been owned by GM for 90 years, but the UK is GM’s fourth-largest market, and many Vauxhall models are designed and built in the UK, for the UK and European markets. 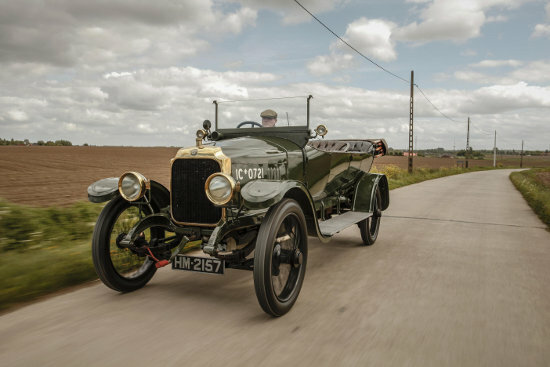 The Vauxhall D-Type Staff Car was made for the British Army during WW1. That’s all for today — normal service will be resumed once the dust has settled after tomorrow’s General Election. This entry was posted on February 14, 2014 by Van Rental. 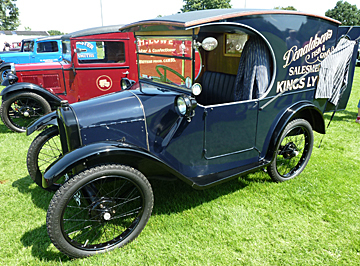 Butcher, baker, candlestick maker… whichever of these trades you were involved in, if you operated a delivery van in the 1920s or 1930s, there’s a good chance it was an Austin Seven — one of the original vans. The Austin 7, the ‘baby’ Austin, was the first truly mass-produced British car and between 1922 and 1939 some 290,000 were built. Today, enthusiasm for owning an Austin 7 is as strong as ever and the National Austin 7 rally never fails to attract a strong entry from all over the UK and Europe. The theme for this year’s rally is ‘Commercial Austin 7s’, and some wonderful examples will join the hundreds of vehicles on display at the National Motor Museum at Beaulieu on the 6th July, 2014. The official rally is on the Sunday but many entrants take advantage of overnight camping to make a weekend of the event. On the Saturday there is an organised run around the New Forest followed by an evening barbecue. Austins form the core of the event, but all tax-exempt historic vehicles of all makes are invited to attend and will have a designated parking area on the rally field. Visitors to the Beaulieu attraction on the day can also see the rally and the venue makes for an ideal day out for all the family. Beaulieu is home to a wide variety of attractions and the rally entry ticket also gives access to the historic Palace House and gardens and the National Motor Museum. For more information on Beaulieu, visit www.beaulieu.co.uk. For more information and entry forms for the rally, visit www.750mc.co.uk/austin7. This entry was posted on May 31, 2013 by Van Rental. 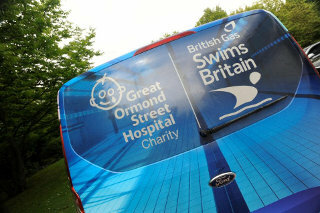 British Gas is hoping to raise £1m for Great Ormond Street with its Swims Britain challenge. British Gas is hoping to raise £1m for Great Ormond Street Hospital Children’s Charity this summer, with the British Gas “Swims Britain” challenge, which aims to encourage thousands of its staff members to take part in swimming challenges around the UK. Challenges will take place throughout the UK, from Windsor in the south of England, up to Glasgow and Edinburgh in Scotland. As I reported recently, British Gas is a big fan of the Ford Transit and recently purchased 520 new Transits, so what better vehicle to support the Swims Britain challenge than a customised Ford Transit Custom? “We wanted a vehicle that British Gas staff could relate to but could provide added comfort and flexibility, and the Ford Tourneo Custom fits the bill perfectly,” said Matthew. The aquatic-themed Ford Tourneo Custom, a long wheelbase model, is powered by a Dagenham-built 125PS 2.2-litre TDCi diesel engine. The vehicle is well-equipped for the UK tour, with nine seats, a 230-volt power converter and Ford’s satellite navigation system. This entry was posted on April 17, 2012 by Van Rental. Vans are most often connected with relentless and unglamorous hard work – but there are exceptions. Two heart-warming stories involving vans popped into my inbox today, so I thought I’d share them with you. 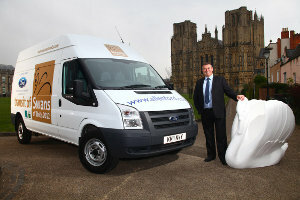 First up is Ford dealer Allen Ford of Bath, which has lent a long wheelbase, high roof Transit to event organiser Megan Witty, who is running the ‘Swans of Wells 2012’ public art initiative this summer, which is being run in celebration of the Queen’s diamond jubilee. The initiative will see the 5ft tall swans, each individually decorated by local artists, sited around Wells between the end of May and September. Each of the 60 swans will be sponsored by local businesses. On 22 May the swans will make their first public appearance in Wells, along the route the Olympic torch will take through the city. They will then go on general display at sites across Wells from 28 May before being auctioned for charity on 29 September. The similar Lions of Bath 2010 event raised £65,000 for good causes. A Volkswagen Transporter will carry Tim Spencer and his team to all 92 football league clubs in 92 hours! Football fan Tim Spencer from Dorset was diagnosed with chronic kidney failure four years ago. He’s hoping to receive a kidney transplant later this year and is battling to help others with the disease by attempting to raise £25,000 for national charity Kidney Research UK, the UK’s leading kidney disease charity. As a keen football fan, Tim hit on the idea of visiting all 92 football league clubs in 92 hours – a journey of 2,200 miles around the UK. For a football fan, this could be the ultimate road trip – so what better vehicle to travel in than a Volkswagen Transporter, kindly leant to him by Volkswagen Commercial Vehicles UK. Due to his current health, Tim will be undertaking the challenge with the help of a small team of friends, and will be setting off on Wednesday 18 April from Plymouth Argyle’s Home Park stadium and travelling across the UK before finishing at AFC Bournemouth’s Dean Court on Saturday 21 April. Tim’s itinerary is available at support.kidneyresearchuk.org/support-us/92in92, plus there will be regular updates via Twitter (#92in92). In addition, Volkswagen Commercial Vehicles will also be inviting people to join in some fun challenges on its Facebook page during Tim’s journey with the chance to win a pair of football tickets. Full details will be posted at www.facebook.com/VolkswagenCommercialVehiclesUK. To raise more funds, the challenge also includes two competitions to win an England football T-shirt signed by former England goalkeeper, Peter Shilton. Full details are available by visiting www.kidneyresearchuk.org/92in92. Anyone who would like to support Tim directly can also make a donation at www.justgiving.com/doingthe92in92. vanrental.co.uk wishes Tim and everyone else involved in ’92 in 92′ the best of luck. This entry was posted on March 10, 2012 by Van Rental. It is now less than a month until the start of the British Touring Car Championship (BTCC). The first round takes place at Brands Hatch over the weekend of the 31st March – 1st April and indications so far are that nine different makes of car will be on the grid, all of them using the new flame-spitting, turbocharged engines that form part of the Next Generation Touring Car specification. The 2012 BTCC title race will take place at nine top race circuits located in eight different counties throughout the country: Brands Hatch, Kent (1 Apr & 21 Oct); Donington Park, Derbys-Leics border (15 Apr); Thruxton, Hants (29 Apr), Oulton Park, Cheshire (10 June); Croft, North Yorks (24 June); Snetterton, Norfolk (12 Aug); Knockhill, Fife (26 Aug); Rockingham, Northants (23 Sept) and Silverstone, Northants (7 Oct). Another of the BTCC’s massive appeals, notably among families, is that admission to all ten of its race weekends is FREE for accompanied children (age limits vary). This includes access to specially organised pit lane autograph sessions with the star drivers plus, at most events, the race teams’ central paddock. 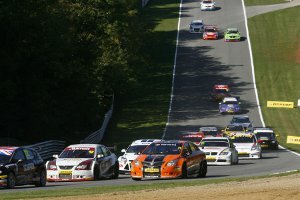 Brands Hatch’s big BTCC weekend (31 March-1 April) will also include the first races of 2012 for the hotly-contested Ginetta Junior, Ginetta GT Supercup, Porsche Carrera Cup GB, Formula Renault and Renault Clio Cup championships that represent the very best in single-seater, sports and saloon car action. Nicolas Hamilton and Josh Hill – respectively the younger brother and son of Formula 1 champions Lewis Hamilton and Damon Hill – will be among those on the Clio Cup and Formula Renault starting grids. Tickets for the event are still available at discounted prices including £25 per adult for Sunday’s main race day. For all ticketing options for the event visit www.brandshatch.co.uk. Admission is FREE for children aged 12 and under all weekend. For a full list of the BTCC’s 2012 race dates and circuits, visit www.btcc.net. Did you watch Top Gear on the 4th March (last Sunday)? If so, you will have seen ‘Brutus’ in action – the fabulous 46-litre, 500bhp aero-engined BMW that was built after WWII using a surplus aeroplane engine! There will be no fewer than four aero-engined cars at the Cholmondeley Pageant of Power in June, boasting a total of 135 litres of displacement and 2,800bhp. Although it’s still early, I thought I would share this with you while last week’s Top Gear might still be fresh in your mind (and ringing in your ears…). 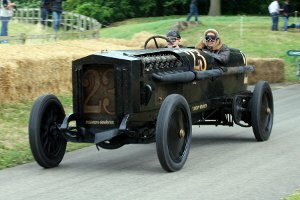 Other aero-engined cars at the 2012 Pageant of Power will include a 23-litre Maybach Zeppelin (affectionately known as ‘Chitty Bang Bang 1’, one of four celebrated 1920s English race cars believed to have inspired the creation of the fictional Chitty Chitty Bang Bang), the 24-litre Napier-Bentley and the fearsome 42-litre Packard-Bentley. Including Brutus, the combined power output for these four cars totals more than 2,800bhp. A full event schedule and list of participants will be announced over the coming weeks, with Pageant organisers set to reveal some exciting new additions and features for 2012. To buy tickets or find further information, visit www.cpop.co.uk. If you are travelling in a large group to one of these events, why not consider hiring a self-drive minibus to cut down on fuel costs and enable you all to travel together with one driver? Click here to compare minibus hire prices. This entry was posted on December 23, 2011 by Van Rental. People who are not familiar with the antiques business in the UK sometimes ask where the ‘biggest’ or ‘best’ antiques fairs in the UK take place. When it comes to the biggest antique and collectors fairs in the UK, there is no competition: The International Antiques and Collectors Fair at Newark is the biggest in the UK. It takes place six times a year at the Newark & Nottinghamshire Showground and attracts up to 4,000 stallholders at each event. Buyers come from all over the UK and from continental Europe and North America – it has a reputation as a trade fair and many buyers are looking for stock for their own antiques businesses, although there are a great many collectors, too. Ardingly, Swinderby and Shepton Mallet are all very large and well-established fairs that have been running for decades, and are popular with trade buyers and collectors alike. I’ve been to Newark and Ardingly many times and they are massive – if you are at all interested in antiques and collectables, as a dealer or collectors, they are well worth a visit. For more details about all IACF fairs, visit www.iacf.co.uk. Need to hire a van or minibus for transport to one of the IACF 2012 fairs? Click here to compare van hire quotes. This entry was posted on December 13, 2011 by Van Rental. Autosport International is Europe’s largest motorsport exhibition. It is aimed at all levels of motorsport – from karting to F1 – and includes the UK’s largest indoor racing track and the F1 Racing Display, providing you with a rare chance to see Formula One cars up close and personal. You’ll be able to get some hands-on experience on the kart track and in some advanced motorsport simulators, while the Live Action Arena provides the opportunity to see the experts at work with racing, stunt driving, drifting and celebrity guest stars. The arena seats 4,700 people and there are six shows a day on the 14th and 15th – so there is no danger of missing out on the chance to see rallycross cars, historic cars, drift cars and much more. There will also be a wide range of exhibitors and other special events – see the Autosport International website for full details and ticket prices. 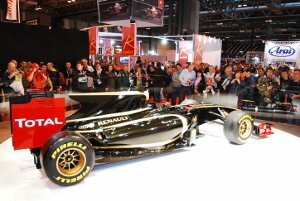 Autosport International 2012 takes place from the 12th – 15th January 2012 at the Birmingham NEC. For full details visit www.autosportinternational.com. 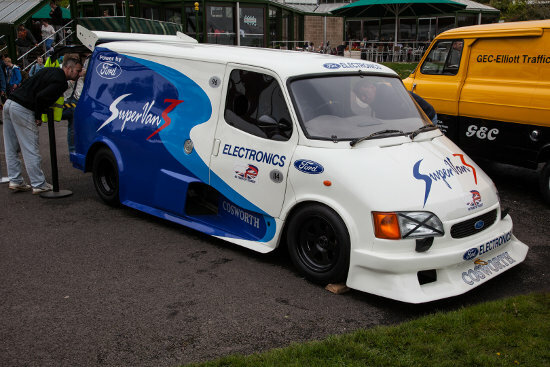 Need to hire a van or minibus for transport to Autosport International? Click here to compare van hire quotes. X Factor Live Tour 2012 Dates & Venues – Book Early! This entry was posted on December 9, 2011 by Van Rental. At vanrental.co.uk HQ, the X Factor usually gets more votes than Strictly. After last weekend’s disappointing eviction of Misha B, we’re left with a trio of talented contestants battling it out for the honour of winning X Factor 2011.
Who will triumph – girl band Little Mix, Louis’ favourite, Amelia Lily, or former Liverpudlian hairdresser Marcus Collins? The final showdown will take place at Wembley Arena this Sunday, but you do not have to leave it until then to book your X Factor Live Tour tickets for 2012 – tickets are already selling like hot cakes and availability is limited at each venue, so get in early. Nine acts* will be performing on the X Factor Live Tour: Amelia Lily, Misha B, Kitty Brucknell, Marcus Collins, Johnny Robinson, Craig Colton, Little Mix, The Risk and Janet Devlin. If you’re planning a trip with a group of friends to an X Factor Live event, there’s no doubt the best way to get there is in a minibus. Click here for an instant minibus hire quote. *Please note that all details and dates are correct to the best of our knowledge – but vanrental.co.uk cannot be held responsible for errors or cancellations. Please check before you make any transport arrangements. This entry was posted on December 3, 2011 by Van Rental. The last few years has seen the television ratings battle between The X Factor and Strictly Come Dancing become something of a pre-Christmas ritual. If you keep your TV firmly tuned to the Beeb, then you may be planning on seeing a show on the Strictly Come Dancing live tour, which starts on the 20th January 2012 and runs through to the 26th February 2012. Events like this are always more fun in a group – so if you are planning a group trip to see Strictly live, then you may want to consider hiring a minibus to get you to the event. That way, you only need one Des(ignated driver) and the rest can enjoy a drink during the interval and a natter en route. In addition, everyone stays together, you only have one parking charge to pay and your fuel bills will probably be less than they would for two or more cars. For full details, visit www.strictlycomedancinglive.com. Please note that all details and dates are correct to the best of our knowledge – but vanrental.co.uk cannot be held responsible for errors or cancellations. Please check before you make any transport arrangements.